The Foundation is proud to announce that two of its grant recipients, Dr. Vincent Goossaert and Dr. David A. Palmer, have been awarded the Association for Asian Studies' 2013 Levenson Prize in the category of post-1900 English-language, non-fiction scholarly books on China for the book The Religious Question in Modern China(University of Chicago Press, 2011). The Religious Question is a tour de force account of Chinese religiosity over the past century and throughout Chinese communities worldwide. 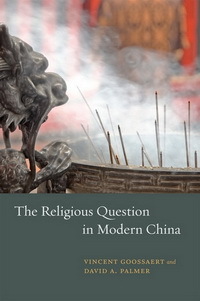 Dr. Goossaert and Dr. Palmer's research reveals the centrality of religious belief, activity, and organization in modern Chinese history, making the development of religious life in modern China as well as its contemporary manifestations readily available for in-depth and comparative research. Dr. Goossaert has successfully completed one major CCKF Research Grant, entitled “Temples, Urban Society, and Taoists: The Transformation of Modern Urban Chinese Religious Organizations” (2006-2009; RG006-U-06). He is currently undertaking a new project, “Chinese Religions in France” (2010-present; RG010-U-10). Dr. Palmer and Dr. Liu Xun were recipients of one of the Foundation's American Council of Learned Societies grants for a conference on modern Daoism held at Harvard in 2006, which was published by the University of California Press in 2012 asDaoism in the Twentieth Century: Between Eternity and Modernity. This project also contributed to the research leading to The Religious Question. The publication of The Religious Question was partially supported by the Foundation, which provided the University of Chicago Press with a Publication Subsidy to cover some of the costs.